Sumptuously furnished home in golf community close to Disney. Overlooking a pine tree conservation area. Free internet(wired and WiFi), local and long distance telephone calls. Pet Friendly. Our beautiful single storey 3 bed 2 bath home is located in the prestigious Highlands Reserve Golf Community, only an 11 minute drive from Disney World. Our home has been professionally furnished and comes with every conceivable amenity to make a perfect vacation. The home boasts a King Master Suite and en-suite bathroom with generous walk-in shower and separate tub. There is also access to the pool deck from the Master Suite via sliding doors. 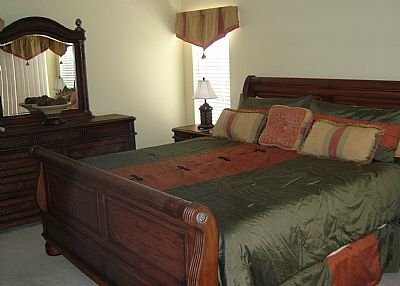 There is a second Queen room with adjacent bathroom , and a further Twin bedded room. All bedrooms have cable TV/DVD and the Family Room has a 32” flat screen TV also DVD and stereo CD system. The pool is a generous size and has an extended deck area to allow maximum exposure to the Florida sun. There is also a spa to sooth the aching muscles after a day in the theme parks! A covered lanai with a large dining table, chairs and loungers completes the picture for alfresco wining and dining while watching the sun set . The family room adjoins the open plan kitchen area and contains a large 3 seat sofa, a 2 seat sofa and a comfy reclining chair allowing plenty of space to relax . An extended pool deck has been added to complement the generous sized screened pool with spa. A covered lanai with ceiling fan provides a haven from the sun , this area being set with a large dining table and chairs for alfresco meals (barbecues may be rented from our Management Agents ) The pool may be heated for an additional cost during the winter months. Within the Highlands Reserve community there is a golf course with driving range, a communal pool, childrens play area plus a full size tennis court just a short stroll away.